Widget encourages you to drink healthier. Is there a better alternative to Juice Bar? Is Juice Bar really the best app in Illustration category? Will Juice Bar work good on macOS 10.13.4? 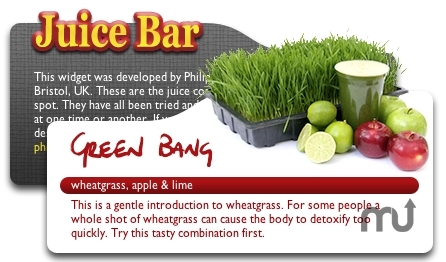 Juice Bar is a Dashboard widget that might encourage you to drink a little healthier. Juice Bar displays a new juice from our collection every every day. Each juice hase its own picture and health advice. Our fruit juices pick from diverse selection of fruit, vegetable and wheatgrass. My personal favorite is Iron Booster but I love them all. If all my work can't get you to dig that old juicer out from the back of your kitchen cupboard, I hope, at least, it will lend your dashboard some fruity colour. I am looking to grow the collection, please send your own fruit and vegetable juice recipes. Version 1.2: This is Juice Bar's third public release. Includes a pull out draw for more detailed juice recipes. Reduced network demand. Only tries to update juice when an Internet connection is available. Latest version fixes a bug common to dialup users where recipes would occasionally not correspond with it's juice. Juice Bar needs a review. Be the first to review this app and get the discussion started! Juice Bar needs a rating. Be the first to rate this app and get the discussion started!